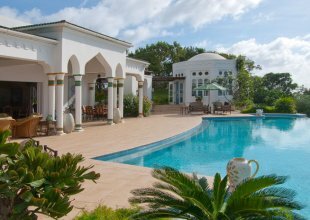 Situated in the centre of Mustique island, this chic contemporary, Caribbean style villa has spectacular views across both the Caribbean and Atlantic Seas and the neighbouring Grenadine islands. Aurora is a wonderfully chic and sophisticated residence built in a contemporary colonial, Caribbean style with cool pavilions that surround the central courtyard garden with its stunning pool. 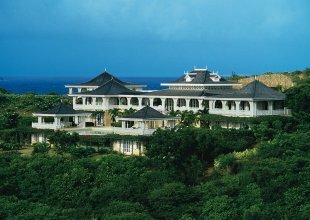 Designed and built by Tony Milsom in 2003 it combines colonial elegance with Caribbean serenity and embraces the natural beauty of its surroundings. Nothing clutters the panoramic views of the island's tropical fauna with the Caribbean and Atlantic oceans beyond. Jasmine Cottage, which can also be rented to provide a further two bedrooms, provides a romantic hideaway, nestled within the gardens with its own living and dining areas and spectacular rock plunge pool. The interior design throughout creates a tranquil yet sophisticated aura with light, cool colours on the walls and soft furnishings and crisp, white bed linens in the bedrooms. Outside there are fabulous open areas where guests can socialise and relax and enjoy the sensational views. Menus and special dietary requirements and requests can be discussed prior to your arrival. Alternatively, wait until you are on-island to discuss your food preferences with the chef or butler or where you might like to dine - perhaps have a BBQ on one of 9 spectacular beaches, or choose a candlelit setting within the romantic gardens of Aurora. The Chef, Tyrone Holdford has been at Aurora since 2005. He spent 16 years working at the Young Island Resort where he worked his way through the ranks to Chef. He has participated from various training courses on island including; Caribbean Contemporary Cuisine Training (November 2006), Canapés (June 2006), Contemporary Cuisine and Advanced Food Preparation (September 2010). N.B. An 18% island tax is applicable to all villa rental prices. • Bedroom 1: King, en suite bathroom and Dressing Room. Private terrace. • Bedroom 2: King, en suite bathroom and Dressing Room. Private terrace. • N.B. Bedrooms one and two can be interconnected. • Bedroom 3: Twin, en suite bathroom and Dressing Room. Private terrace. • Bedroom 4: Queen bedroom with en suite bathroom. • Bedroom 5: Queen bedroom with en suite bathroom. Tropical gardens surround Aurora with paths leading to the central courtyard gardens where the pool and sun decks are positioned. Cool palms and exotic tropical ferns line this area harmonising with the tropical views beyond. A pathway leads to Aurora's dramatic lookout gazebo. Further down the gardens is Jasmine cottage, which is also surrounded by tropical plants including frangipani and bougainvillea with splendid views of Macaroni Beach. Aurora has spectacular panoramic views across the island stretching from the west with the Caribbean Sea and neighbouring Grenadine islands to the east on the Atlantic side. Views of sunsets and sunrise are legendary. Please call +44 (0)1202 203656 or email us for further information. HOW DID YOU HEAR ABOUT VILLAS IN LUXURY?